An average person uses the bathroom for 30 minutes around 6-8 times per day, which is about 12,000 hours in a lifetime! If you’re the one who cleans your own bathroom, just add 5 minutes of cleaning time, 2-3 times a week, to that average time in the loo. Even for the busy homeowner, this task is pretty doable, if you have the right cleaning aides at hand, and a timely cleaning schedule at least twice a week. 1. Clear up the room.Start by setting aside all the toiletries, towels, and fragile ornaments in a basket or large basin, so there won’t be any accidents and you’ll have a clear space to get you going. 2. 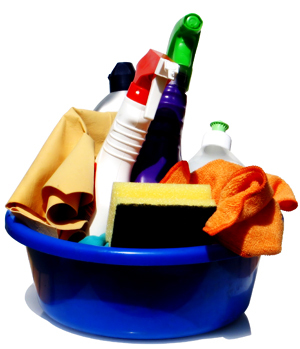 Gear up for cleaning.Put on your rubber gloves and prepare the all-in-one cleaning solution in a basin (typically, you dilute the solution in 500ml water), which will be all you need for cleaning from floor up to the walls of your bathroom. There are “no-rinse” solutions on the market nowadays. 3. Work from the cleanest to the dirtiest.With a sponge, apply the cleaning solution to the shower, sink and tub, wall tiles, and the toilet last and let it sit. With a damp cloth, wipe down doors and corners. If there is scum, especially between the tiles, thoroughly scrub with your handy brush. Use a toilet cleaner and brush to scuff clean the inside of the bowl. Wipe the towel rods, sink and tub for a good shine. Mop the floor. Here’s a tip: Use newspapers to clean mirrors and glass doors or walls. Remember: It’s important to make it a habit keeping your bathroom clean. It’s not fun, but it’s necessary. Keep up with this 5-minute strategy and keep the germs at bay!